Bontrager released a new lineup of aerodynamic road saddles today for the growing segment of road cyclists looking for every advantage against the wind. Each of the three all-new Aeolus saddles is designed to keep riders comfortable even when they’re rotated forward in a tucked aero position. The new design features a full cutout, a shorter overall length, and a wider nose—all of which plays a part in relieving pressure on soft tissue areas for riders of all genders and body types. There are three models in the new lineup of Bontrager Aeolus saddles: Pro, Elite, and Comp. Aeolus Pro has OCLV Carbon rails, a carbon-reinforced shell, and minimal padding to keep weight to a minimum. Aeolus Comp and Elite have more padding and alloy rails. All Aeolus saddles feature a split design with a full cutout that minimizes soft tissue pressure and allows for a more powerful, rotated position. 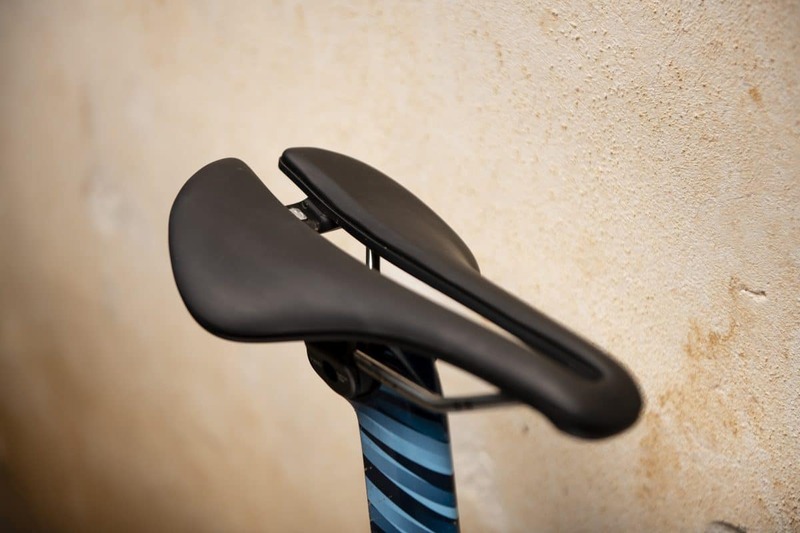 All Aeolus saddles also have full-length rails, which allow for the whole saddle to flex for extra comfort. Aeolus has a wider nose with a shorter overall length that ensures the whole saddle is usable and comfortable, whether you’re sitting up on the hoods or hammering in the drops. Bontrager uses the latest biomechanical research and equipment to offer an even distribution of pressure and targeted support. All inForm saddles, including Aeolus, are designed to maximize comfort, power, and speed. Aeolus saddles work with Bontrager’s new Blendr accessory mount, which attaches securely to the rear of the saddle for clean integration with any Bontrager Flare rear light while still leaving enough room for a seat pack. Aeolus saddles are designed and tested to work well for a wide range of riders of any body type and gender, and they’re available in multiple sizes to provide the best individual fit. Like all Bontrager products, new Aeolus saddles are backed by the Unconditional Bontrager Guarantee, which gives riders 30 days to love their purchase. If they don’t, we’ll take it back. It’s that simple. New Bontrager Aeolus Pro ($229.99 MSRP), Aeolus Elite ($149.99 MSRP), and Aeolus Comp ($89.99 MSRP) saddles are available exclusively online at trekbikes.com and through Trek’s global network of retailers.